WCQ: What to expect from the week ahead in Asia? International week returns for the final time this calendar year, as we anticipate the mid-point of the final round of World Cup qualifying in Asia. Ahead of Tuesday’s qualifiers, Martin Lowe considers three under pressure managers, eager to turn things round at their respective national teams, with two in particular sweating in the dugout early next week, hoping to remain in employment going into the New Year. 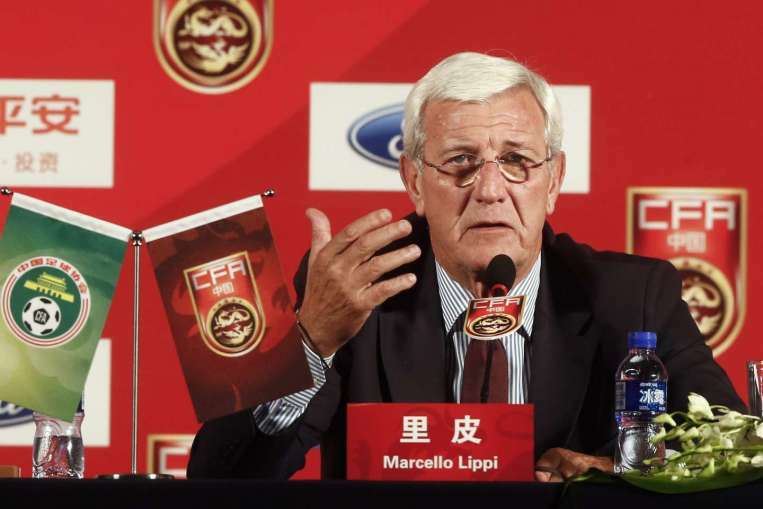 Already a UEFA Champions League and World Cup winner, Marcello Lippi went one step further becoming the only manager in history to win both the European and Asian Champions League titles, alongside three successive Chinese Super League titles with Guangzhou Evergrande. It was a fitting way to bow out it, on the top of his game, proving he could do it on more than one continent. However, a year and a half since leaving the Chinese champions, who have gone on to win the last two domestic titles in the meantime, he’s back to take the reins of a whole different beast in the form of the Chinese national team. Beyond the ludicrous salary (reportedly £18 million a year), Lippi returns with an appreciation of the country. He could’ve gone back to Europe, he could’ve taken bigger money moves elsewhere in Asia, but it’s telling he’s returned to China, to a slowly improving but testing assignment with the national team. No one’s expecting miracles this time however, China aren’t going to win the World Cup, they won’t even get close to winning the Asian Cup in 2019. This will prove a project, largely unfamiliar to Lippi. His predecessor Gao Hongbo, who resigned last month after defeat in Tashkent to Uzbekistan, ultimately crumbled under the pressure of a nation expectant of qualifying for the World Cup, without having a capable squad to effectively do so. Gao took over initially on a temporary basis at the latter end of Round 2, scraping their way past Hong Kong to make it to Round 3. It shouldn’t have ever been expected he’d provide miracles again and get past the likes of Iran and South Korea. Despite a home draw against Iran in September, China have lost their other 3 matches (including their home tie with Syria) and sit bottom of the table, in a position of unlikely resolution. If anyone can change it around however it’s Marcello Lippi. He has the glamour, he has the prestige, but crucially he has the will, by no means is he a mercenary. Realistic ambition is needed over the coming few months, despite an intensive two week training camp that included no less than 43 players, Lippi will have a good idea of what he has, but won’t have had the time to fully integrate his thoughts to the maximum. There’s no easy start either. If they want to go into the half way break on a high, they must beat fellow stragglers Qatar, if they have an outside view on a 3rd place playoff spot. Qatar themselves are under new management, but a month ahead of the Chinese, having the desired bounce they sought, with an improved performance against South Korea before clinching their first victory of the round against Syria in October. This match may pit the two bottom sides in the section together, but it’s a pivotal moment of the round. Lippi’s first squad predictably called upon seven of his former Evergrande playing staff, including a return for former captain Zheng Zhi. There is also a recall for enigmatic goalkeeper Wang Dalei, who didn’t feature competitively under Gao, despite appearing prominently in Round 2. With a considerable domestic and international gap between next week and the beginning of March, whatever Tuesday’s result is, it will have a major impact on the mood within Chinese football over the winter off season, which concludes a monumental year of ups and downs. Two managers fresh into the job, in charge of two teams lacking confidence. The victors will be well placed to make an assault on Russia qualification as we head into 2017. Last chance saloon for Stielike? They may not have lost a competitive game since the Asian Cup before last month, but South Korea’s defeat to Iran in Tehran has seemingly opened some long held skepticism of their German coach Uli Stielike, which could see the end of his tenure as early as next week, if Korea go on to lose to Uzbekistan in World Cup qualification on Tuesday. The man who brought a steely defensive edge in the early parts of his Korean rein, is slowly losing touch with not just the team but the nation’s fanbase, which can’t allow you to rule out that he wouldn’t walk away irrespective of the result. BREAKING | If South Korea lose the next #WCQ2018 game against Uzbekistan, Uli Stielike will resign from his post. Positive results aside, South Korea have looked sluggish in this final round of qualification. Despite a comfortable 3-0 lead over China in September, they nearly threw it away in the final minutes. This was followed by a draw against arguably the weakest side of the section in Syria, a forced comeback against struggling Qatar at home before the defeat against Iran. All-in-all they’re lucky to be sitting on 7 points from 12. The reliance on defence seems to have gone out of the window, instead putting faith in their talismanic winger Son Heung-Min to at times singlehandedly drag his team through matches; in Tehran he just didn’t get the assistance needed. The other side of the coin is the cultural differences. Firstly on a footballing level; Korea aren’t playing the “Korean way” and haven’t been since Stielike took charge. Yes, in the main they are better organised and tougher to beat, but the technical, possession side of their game has slowed down. Secondly, the wider social nuances; summed up by Stielike’s frustration at not having a striker of Qatar’s Sebastian Soria to call upon after their Syria stalemate in September, when an apology would’ve instead been welcomed by Korean fans. “I know some players feel difficulty when talking with me, but I think they can tell their stories comfortably to (him), Cha had played with these players in recent years. His job is more like a (veteran) player.” Whether he likes it or not, movement behind the scenes to smooth over the relationship between players, fans and himself seems to be gathering speed, and with Cha choosing to leave a promising coaching education in Europe behind, some have speculated that he may be being eyed up as Stielike’s future successor. After refusing to name a full 25 man squad in October, Stielike has named a full cohort of players this time for the upcoming Uzbekistan qualifier (and Canada friendly). This included the shock return of Yun Suk-Young, who despite finding a club in the last few months in Danish side Brondby, has yet to see any league action with them. Suk Hyun-Jun has been left out, while recent form propels Salzburg’s Hwang Hee-Chan into a possible lone forward role after netting 5 goals in his last 5 outings for the Austrian champions. Stielike underlined the fact earlier last month, that defeat in Seoul would see him exit the national team fold. A worrying prospect, given Korea would fall 5 points behind an automatic World Cup birth, with 5 games to play. Will Japan keep faith with Halilhodzic through to 2017? Saudi Arabia have been the biggest surprise package of this round of qualification. Regularly the underachievers of modern day Asian football, Dutchman Bert van Marwijk has harnessed the talent at his disposal to become an effective team on the pitch. A draw against Asian champions Australia followed up by a sweeping victory over UAE in October sets up arguably their toughest challenge, their first real test away from home against Japan. In the opposing technical area, Vahid Halilhodzic remains a frustrated figure, continuing his prickly line that continues to question Japanese football with ever increasing regularity. Defeat in this match, going by Japan’s recent coach sackings, would probably see him out of the job before Christmas, given their opponents would then move 6 points clear of the Samurai Blue at the half way stage of the round. It hasn’t been a horrendous couple of months for Japan by any means, it just hasn’t got going, ﻿playing catch-up from the word go, after losing their home opener to UAE, which really was there only disastrous result on paper. Subsequent victories over Thailand and Iraq, however laboured, were 6 points on the board, and a draw against Australia, in the circumstances is another good result to add to the pile. With a three point gap between them, and the fact that Japan are at home, the onus will be there from the Saitama crowd for the home side to go for the win, and win well. Questions have been asked of Halilhodzic’s selection of late, in particular of poster boy Shinji Kagawa, who has been pretty non-existent, while a lack of regular domestic football puts a concern over the sharpness of their usual go-to striker Shinji Okazaki. Now that Takuma Asano is starting to find starts on loan, with fellow Bundesliga based Yuya Osako also finding his feet this season, the options remain open to the Bosnian ahead of Tuesday’s match. Halilhodzic has regularly acknowledged his uncertain position, and assumes his days will be numbered if Japan do lose next week. With a tough bunch of away fixtures to come in the new year, whoever’s in the post come March may be thankful of a mere playoff spot.